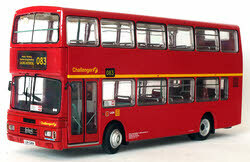 The Britbus R Series contains seven variants of the Alexander R & RH double deck bus, the models can be produced in both single & dual door form and with various destination blind layouts. Some versions also have split height front entrances. Scania N112/N113 & Leyland & Volvo Olympian versions are all catered for and a range of different front grille designs are used to cover a wide range of different vehicles. 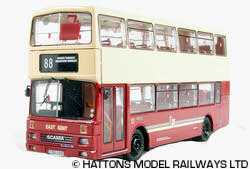 The R700 series depicts the Belfast built version of the body and this features a different window layout to that found on all the other versions, some of the models in the R700 Series have been released in the Irbus branded range. The first R Series models were released in late 2004 and a steady stream of releases has followed since then with the first pair of the newest R40X variant being released at the very end of 2009. All the models issued have poseable front wheels & opening rear engine panels.